The first recipe in our ‘GAA Winning Taste of Summer’ series is Kevin’s take on the traditional ham sandwich, synonymous with the GAA. Go on, give it a try! Combine the mayonnaise and mustard together in a small bowl. Lay the bread on a flat surface then spread a layer of the mustard mayonnaise on each slice. 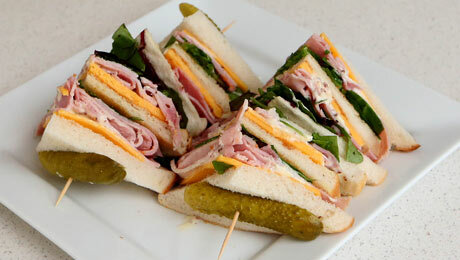 Place some lettuce leaves on two slices of bread, a few rings of red onion, ham, gherkins then add a slice of cheese. Add a tbsp of tomato chutney, then top with the remaining slices of bread. Accompanying beverage suggestion: A flask of tea! TIP: Wrap in parchment paper rather than clingfilm as it will prevent the sandwich from getting a wet texture. Take a picture of your attempt and share using #SVwinningtaste or enter online to be in with a chance of winning great prizes!